The ending! I have to read 11 and 12 back to back, because…well, the ending to Sailor Moon is quite intense. This also means it’s nearly impossible to review without spoilers, but I shall try. In this volume, we get to see Usagi face her greatest enemy, essentially all by herself. This battle can also change the peaceful future everyone is guaranteed. In the midst of it all, we learn who Chibi-Chibi is and see Chibi-Usa’s sailor team in action. But don’t worry. That happily ever after is all worth it. A great manga featuring female superheroes and villains. 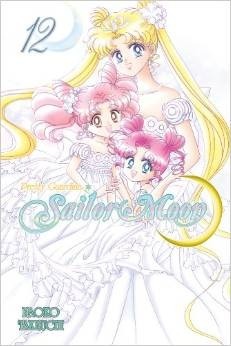 Recommended to: Sailor Moon fans and readers of shoujo manga with sci-fi/fantasy, superheroes, and galaxy-themed characters. Favorite panel: I mean, that last panel from Mamoru’s perspective. It doesn’t get any better than that. Favorite Quote: Even if one day, we all have faded away, and new Sailor Guardians…new heavenly bodies are born…Sailor Moon, you likely will be forever immortal. Sign into Goodreads to see if any of your friends have read Pretty Guardian Sailor Moon Vol. 12 Pretty Soldier Sailor Moon.